Before you simulate floating through the sky, register at the front desk for your flight suit and learn the ins and outs of indoor skydiving. During a training class, an experienced professional runs through all the basics: how to hold your body while flying, hand signals, and safety procedure. Look the part by donning a flight suit, gloves, goggles, helmet and ear plugs. When you’re ready to catch some serious air, enter the wind tunnel area with a small group of no more than five people, plus the instructor. You’ll each take turns whipping and turning weightlessly in the air, simulating the feeling of freefalling from a plane. 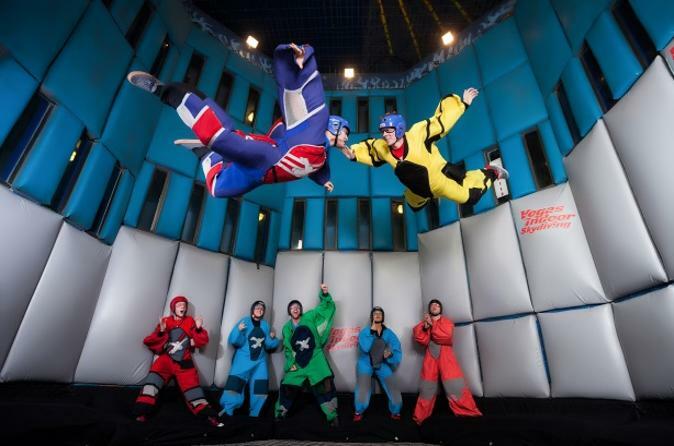 Whereas typical skydiving freefall time typically lasts roughly a minute, this simulation grants three minutes of uninterrupted air time over the high-powered wind tunnel. The airstream safely lifts you skyward, with highly trained instructors within an arm's reach. Experience the thrill of weightlessly hurtling through the sky, with none of the risk or weather concerns. It’s the perfect way to get another kind of adrenaline fix on the Vegas Strip!